Check the “News” section for updates on the site and my personal rants that don’t have to do with the current comic. Good morning Marines and whoever else decides to read this! So this is the first post, the first comic, the launch of Terminal Lance officially. 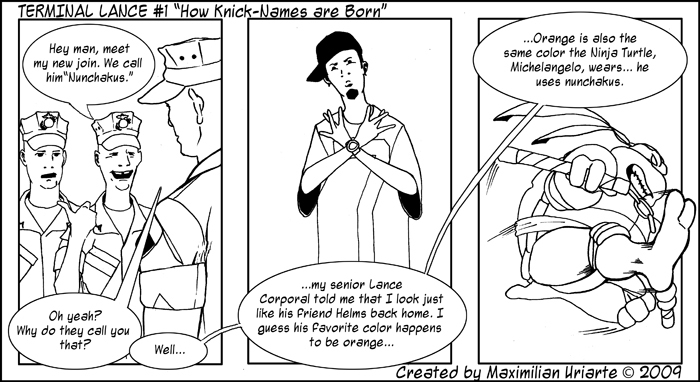 This comic was inspired by my experiences with the crazy knick-names that get invented around here. We’ve all seen it happen, standing around in our circles talking–one sentence leads to the next, one connection to another, and suddenly you have a knick-name for someone that has nothing to do with what you were originally talking about. I suppose I was always lucky, my last name was too hard for my seniors to pronounce so they started calling me by my first name–Max. This ultimately just became my “knick-name”, even though it was my actual name. So as you can see, the site is pretty bare-bones at the moment. I just wanted to get this thing rolling as soon as possible, as I had put it off too long as it was. Ultimately I plan on putting in a forum and a downloads page for wallpapers and the like. My goal for this site is to kind of be a haven for the Terminal Lance in all of us to come hang out and chat with other Marines and people from around the Corps. Whether I meet this ambition or not, we shall see, but in the mean time please enjoy the comic and look forward to the forums which will be coming soon. This site will also serve as my personal soap-box for all things Marine Corps and probably even personal. If you’re into that kind of thing, also look forward to my blog posts. If not, just sit back and enjoy the comic, which I plan on updating at least once a week, though ultimately I want to do it twice a week. The update days are still up in the air, though I’m thinking Tuesday and Friday.